Every pack is under the supervision of a pack committee. This committee consists of a minimum of three qualified U.S.citizens of good character, 21 years of age or older, who are selected by the chartered organization and registered as adult leaders of the BSA. One of these is designated as pack committee chair. Obviously, with a committee of three,members must assume responsibility for more areas of service than with a committee of seven or more, where the responsibilities can be spread around.Although packs can and do operate with a minimum of three committee members,experience has shown that a larger committee generally ensures a stronger, more stable pack. 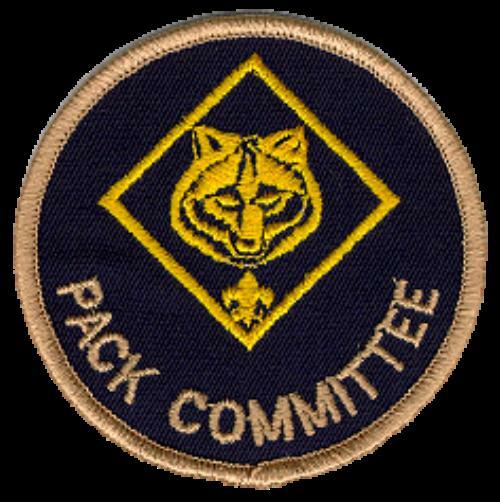 A larger committee is better able to perform all the required functions of a successful pack program. It is also a way of involving more pack families in meaningful service to the pack. • Make recommendations to the chartered organization for final approval of pack leadership. • Recruit the Cubmaster and one or more assistant Cubmasters, with the chartered Organization’s approval. • Provide adequate and safe facilities for pack meetings. • Coordinate the pack program with the program of the chartered organization through the chartered organization representative. • Assist with pack charter renewal. • Help to stimulate the interest of parents through proper programming. • Supervise finances and equipment. • Work closely with the Cubmaster. • Ensure that Cub Scouts and Webelos Scouts receive a year around, quality program. • Complete Pack Committee Fast Start Training and Cub Scout Leader Basic Training. • Conduct, with the help of the Cubmaster, periodic training for parents. • Cooperate with other Scouting units. A strong pack committee will have individual members assigned to such areas as record keeping and correspondence,finances, advancement, training, public relations, and membership and re-registration. The pack committee chair decides how the responsibilities should be divided and gives committee members assignments. Details of the various pack committee functions follow.